Corning asked a Georgia court last week to dismiss the negligence and other claims filed against it last year by IBM in a lawsuit regarding the distributed antenna system (DAS) at Mercedes-Benz Stadium, claiming in part that IBM was responsible for any performance issues since it “failed to follow Corning’s design,” among other issues. 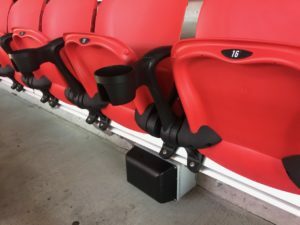 Since neither side is speaking publicly yet about the issue, we are pretty much left with the court document filings as the only way to figure out what exactly went wrong with the DAS installation at Mercedes-Benz Stadium, which opened in 2017. While IBM has claimed that the issues were Corning’s fault, Friday’s filing (which we have not yet seen) has Corning putting the blame back on IBM and its outside DAS deployment contractors. 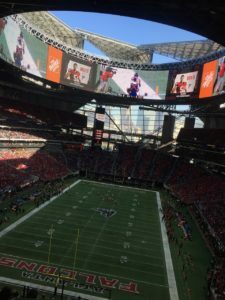 The wireless networks at Atlanta’s Mercedes-Benz Stadium are “ready for the Super Bowl,” according to Michelle McKenna, senior vice president and chief information officer for the NFL, who spoke to Mobile Sports Report via phone last week. 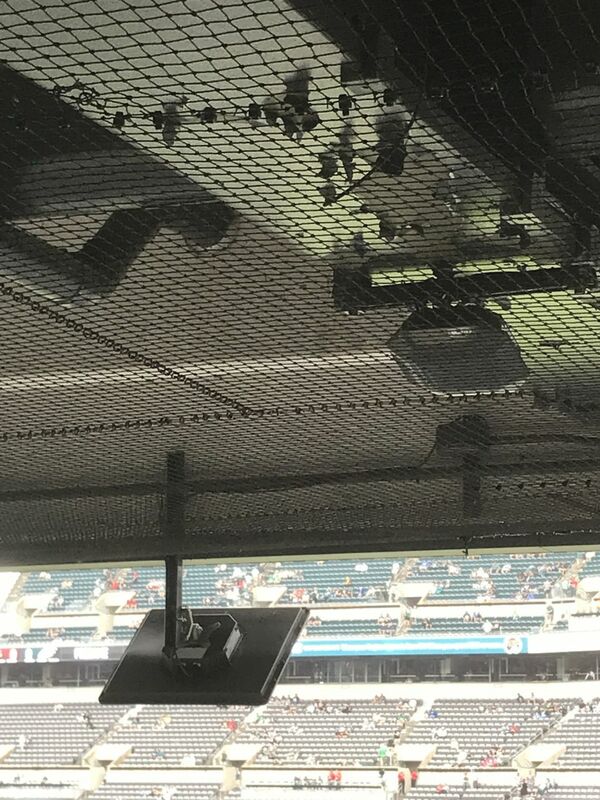 Though McKenna would not comment on any of the particulars of the recent lawsuit filed by IBM against Corning that revolves around issues with the stadium’s distributed antenna system (DAS) cellular network, she did assert that any past problems have since been fixed, and that the league is confident the venue’s wireless systems will stand up to the stress test that will likely arrive when Super Bowl LIII takes place on Feb. 3, 2019. Mercedes-Benz Stadium also has an Aruba-based Wi-Fi network, which has not been the subject of any lawsuit; however, stadium officials have also not ever released any performance statistics for the network since the stadium’s opening. According to IBM’s lawsuit documents, the company said it had to pay extra to fix the DAS network, a task it said was completed before the end of the 2017 NFL season. 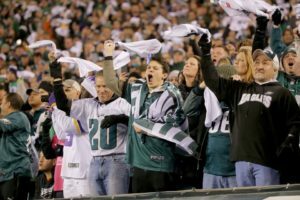 While the Super Bowl is almost always the biggest single-day sports events for wireless connectivity, McKenna added that this year’s version will be even a little more challenging than others since the league is in the process of moving fans to digital ticketing for its championship event. 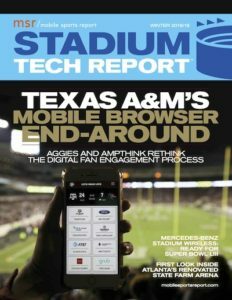 “This year one of the new challenges is the move to paperless ticketing,” said McKenna in a wide-ranging interview about NFL technology issues (look for a full breakdown of the interview in our upcoming Winter Stadium Tech Report). 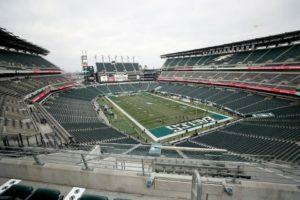 Though this year’s game will still have some paper-based ticket options, McKenna said the lessons learned in ensuring good connectivity outside the stadium gates will help prepare for future Super Bowls, which will likely be all-digital ticketing. One Super Bowl technology not yet decided is the game-day app, which for the past two years has been built by the NFL. In previous years, the league used versions of local game-day apps with Super Bowl additions, a direction McKenna said the league might still take this year. 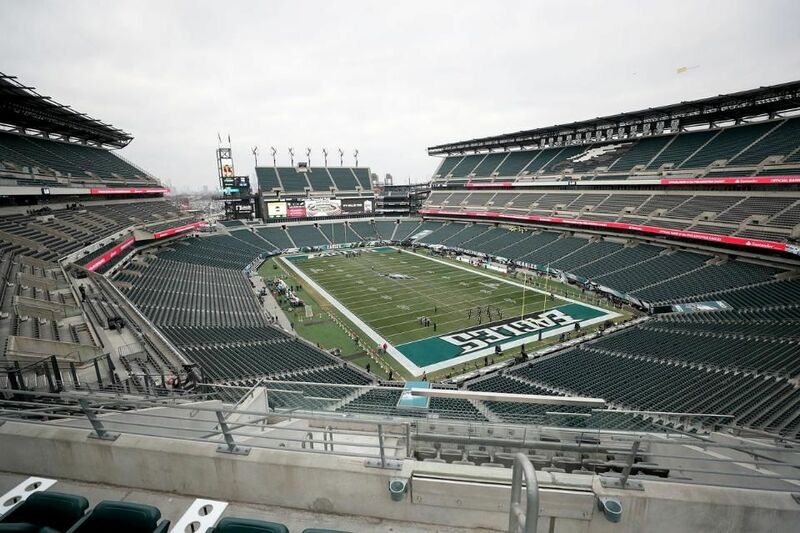 Designed mainly as a way to help visitors find their way around an unfamiliar stadium and city, the Super Bowl app this year might need to lean on the local app to help integrate the digital ticket functionality, McKenna said. 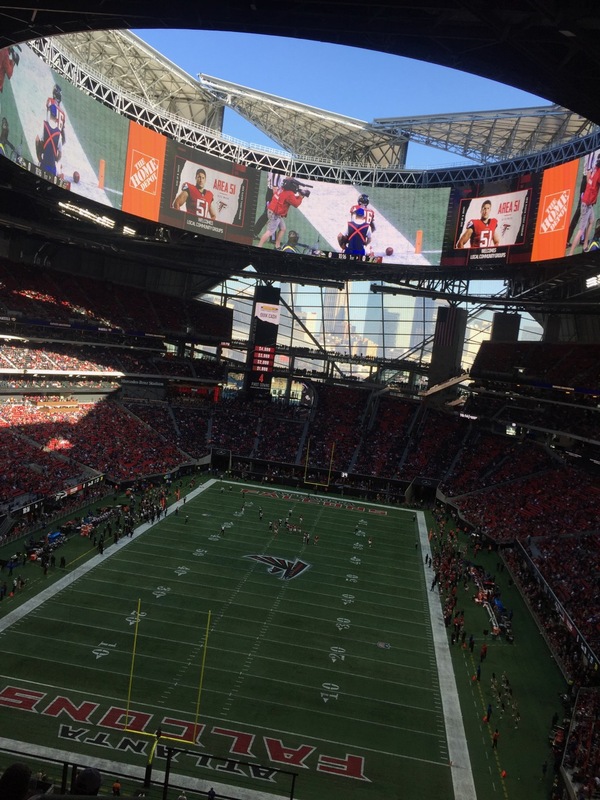 The Falcons’ app for Mercedes-Benz Stadium was built by IBM. 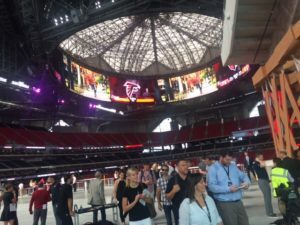 In a personnel move that may have some technological impact on the upcoming year’s Super Bowl, former Atlanta Falcons chief digital officer Jared Miller is now executive vice president and chief operating officer at Madison Square Garden Ventures, according to Miller’s LinkedIn page. We haven’t yet spoken to any of the principals involved, so more details will have to come at a later time (maybe at next week’s SEAT conference in Dallas, where the greater world of the sports technology marketplace regularly gathers). 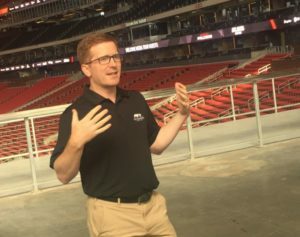 Miller, as those who read MSR know, was the point person for all technology deployments at Mercedes-Benz Stadium, the new roost for the Falcons that opened last summer and is scheduled to host Super Bowl 53 in February, 2019. 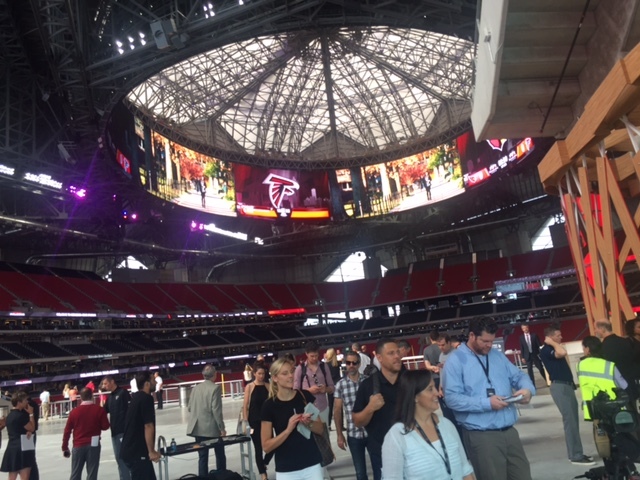 If history is any guide, the networking teams at MBS are likely already busy preparing for the NFL’s big game — in the recent past, carriers have used the offseason before a Super Bowl date to update the DAS inside Super Bowl venues, a task likely already underway in Atlanta. What’s not known is how Miller’s departure may or may not affect technology strategy decisions, either on the DAS side or on the Wi-Fi side of things. 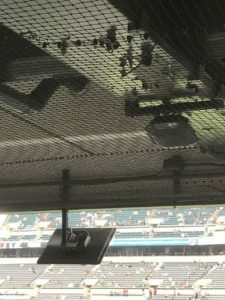 After touring MBS during a press day last summer, MSR did not receive any network-performance updates during the 2017 football season, despite repeated requests to stadium representatives, including Miller. Mercedes-Benz Stadium also hosted the College Football Playoff championship game this past season, but for the first time in years the stadium hosting the game did not provide Wi-Fi usage statistics.